Overall print size 34¼" x 23½"
"Irish and I came into the break smoking at 500 knots, below the level of the flight deck. I could see thousands of men watching from the catwalks. I made a six-G break turn with 90 degree angle of bank. We landed after one of my best passes of the cruise." Commander Randy 'Duke' Cunningham. Back on deck, first to shake the hands of Lt.Randy Cunningham and his Radar Intercept Officer, Lt (jg) Willie 'Irish' Driscoll, was ordnancement Willie White: "Mr. Cunningham, we got our MiG today, didn't we!" 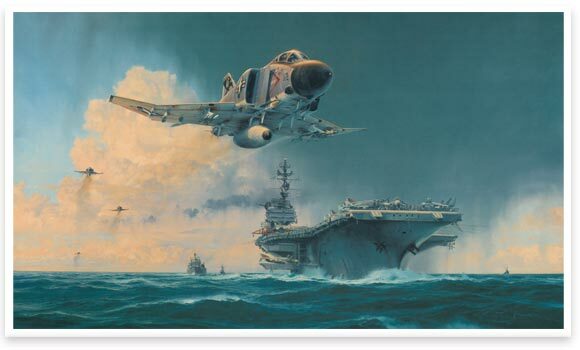 It was January 19, 1972 aboard the USS Constellation in the Gulf of Tonkin. As Cunningham shut down the engines of his 'Fighting Falcons' F-4J Phantom, Task Force 77 Commander Admiral Cooper congratulated Cunningham and Driscoll on achieving their first of five air victories They went on to become the US Navy's only Aces of the Vietnam war.